Motor yacht MAXIMO is 27,42m (89' 11") 2007 charter yacht created by Pershing Yachts. 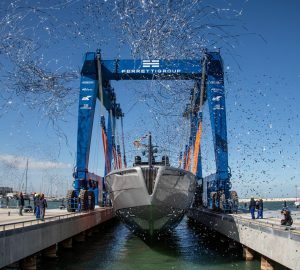 The Pershing 90' is a new, aggressive, captivating and revolutionary Open Yacht. MAXIMO can accommodate up to 8 guests in 4 cabins and is available throughout the Western Mediterranean for luxury yacht charters. 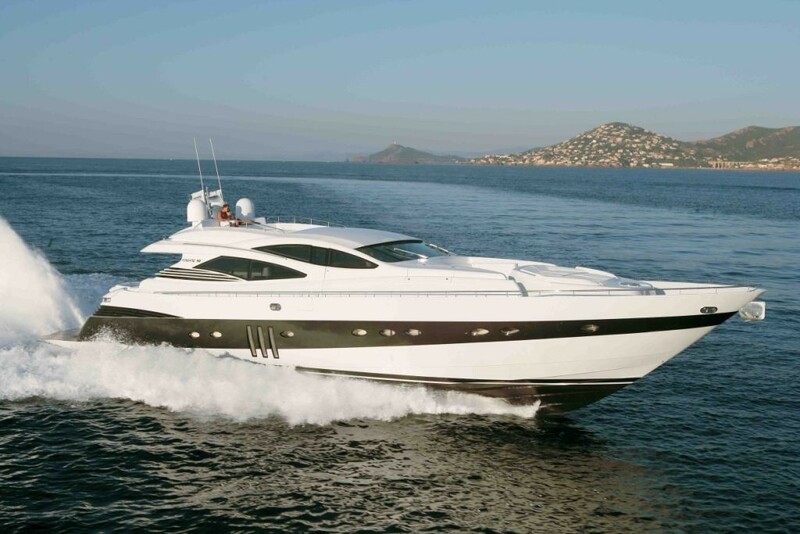 The Pershing 90 MAXIMO combines seaworthiness, speed and comfort. MAXIMO’s upper saloon is a wide and unique open space, with comfortable dining table just forward of the salon’s crocodile sofas and entertainment systems. 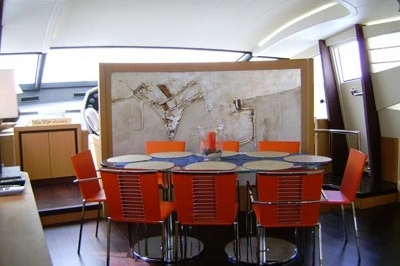 Just forward of the dining area is the wheelhouse where the captain can reach a cruising speed of 38 knots and a top speed of 44 knots thanks to her twin 2435 MTU engines. 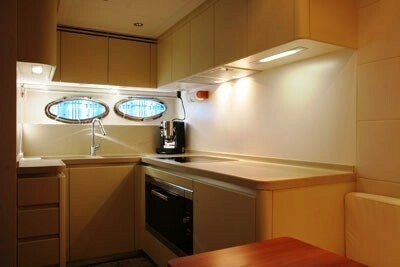 MAXIMO has a modern and fully equipped galley in a separate room. 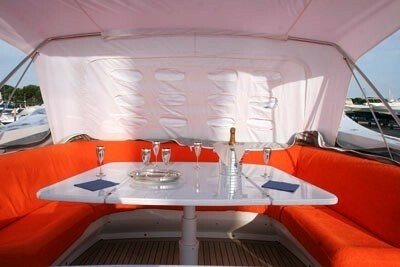 Luxury motor yacht MAXIMO can accommodate up to 8 guests in 2 large double cabins and 2 guest cabins with twin beds. 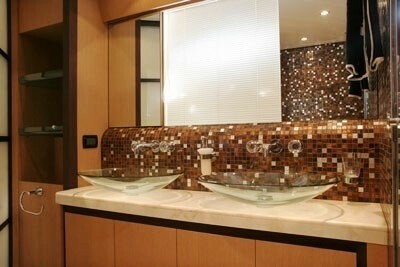 All of the cabins have a private en suite bathroom. 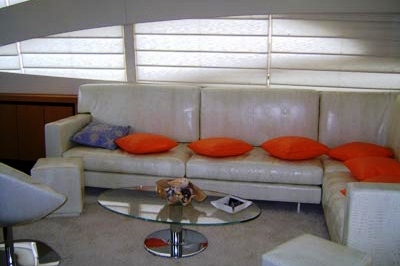 Special attention was paid to the motor yacht MAXIMO’s interior design with accessories and fixtures such as a leather floor in Master Cabin, bathroom with golden handmade mosaic tiles and Swarovski taps etc. 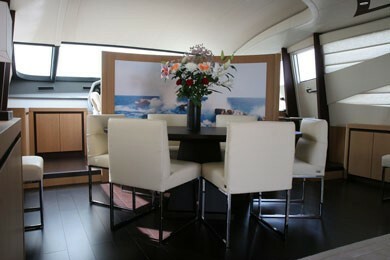 The Pershing 90 MAXIMO has a very comfortable cockpit area with a U shaped sofa and dining table. In addition to the aft deck space there is also a spacious bow dinette with bimini top and a solarium, which is a very private area, almost a kind of flying deck, with a large cushion and a comfortable sofa, facing forward even when cruising. On MAXIMO’s stern, over the engine room, there is a garage, where a good tender (with Hydrojet engine) and a Jetski Seadoo can be stored. 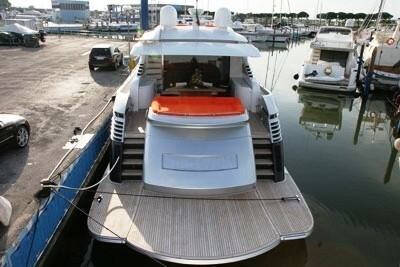 MAXIMO has a crew of 3 ready to welcome you onboard. 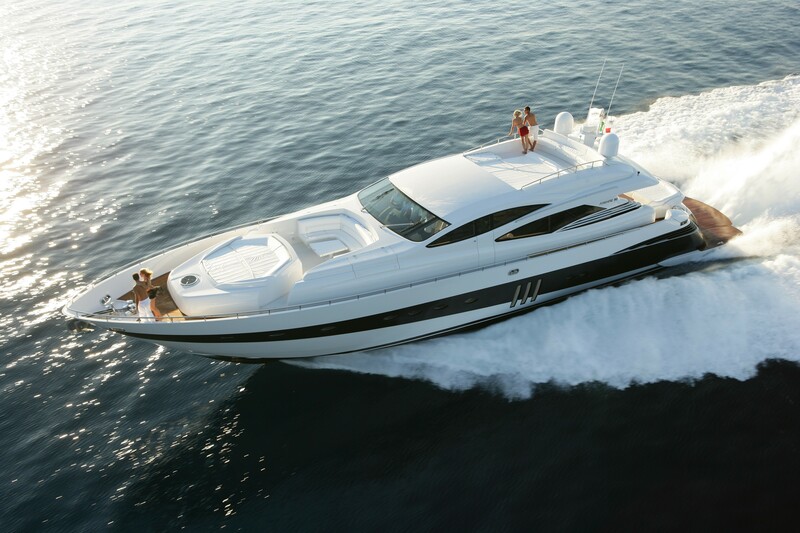 Luxury motor yacht MAXIMO has accommodation for up to 8 guests. 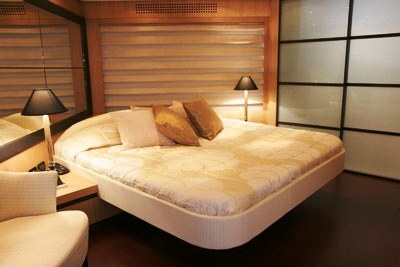 Her master cabin features a double bed, leather floor, ensuite bathroom with shower and bidet. 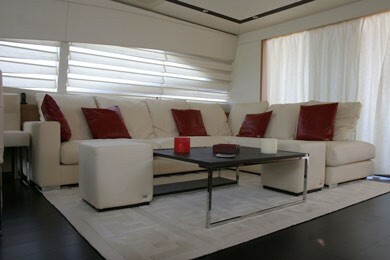 The VIP cabin has a double bed and ensuite bathroom with shower and bidet. The 2 guests' cabins are twin bedded with ensuite bathroom with shower. Downstairs, in the rear part, there is a very well equipped galley with sofa and dining table for the crew, completely separated from guests' accommodation, and close to the crew's quarter (2 cabins, 1 bathroom and laundry). Motor yacht MAXIMO's Tenders & Toys include a 3.5m Zodiak tender with Hydrojet engine, Seadoo jetski and 2 electrical scooters. 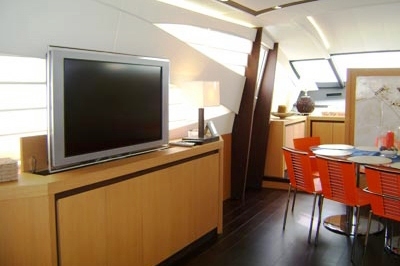 Audio Visual Equipment and Deck Facilities include TV in each cabin with DVD and Sky.